Animation studio, Klasky Csupo, was founded by the then-husband and wife team of Arlene Klasky and Gábor Csupó. They got their first big break on The Tracey Ullman Show and the early cartoon shorts featuring future pop culture icons, the Simpsons. Klasky Csupo went on to animate the first three seasons of The Simpsons show before Film Roman took over. This might have been a big blow to anyone else, but the company had just created a hit series for Nickelodeon called Rugrats. Klasky Csupo went on to create two more animated shows for the cable network, The Wild Thornberrys and Aaahh!!! Real Monsters, as well as the adult-oriented Duckman for the USA Network. Aaahh!!! Real Monsters follows the misadventures of three monsters as terrorize unsuspecting humans while attempting to keep their existence a secret. 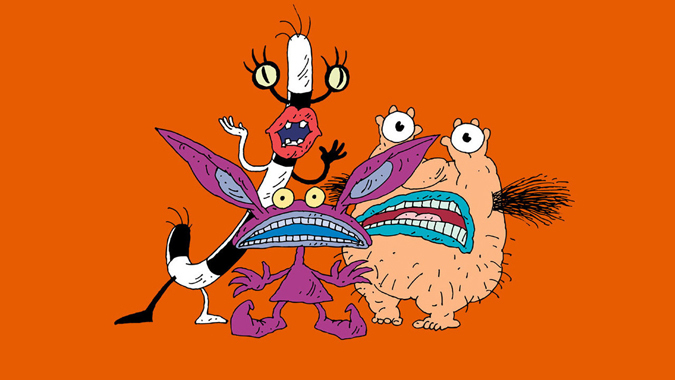 The lead characters are Ickis, a purple critter resembling a demented bunny rabbit; Oblina, who looks like a black and white striped candy cane with thick, red lips; and Krumm, a pink creature who carries his detached eyeballs in his hands and frightens others with his overwhelming body odor. The trio attends monster school and dwell with their fellow creatures underneath a landfill in New York City. Ickis, Oblina, and Krumm work hard to please their stern taskmaster, the Gromble, who threatens his students with unspeakable tortures should they fail in their lessons. Usually, it’s Ickis that finds himself on the Gromble’s bad side, but the monsters and their instructor sometimes find themselves working together. In “The Master Monster,” Gromble is replaced by the overly bureaucratic Blook the Granfaloon, leaving the monsters longing for their old teacher’s more exciting syllabus. The concept of Real Monsters sounds a bit like Monsters, Inc., but the show predates it by seven years. Also, Pixar’s hit film is a lot more cute and cuddly than Real Monsters. While not as bizarre or gross as Ren & Stimpy, Real Monsters has an oddball look and feel similar to Rocko’s Modern Life. Many veteran voice actors lent their talents to the series. Ickis was voiced by Charles Adler, who played Buster Bunny on Tiny Toons as well as succeeding the late-Chris Latta as Starscream and Cobra Commander on the modern versions of G.I. Joe and Transformers. Christine Cavanaugh, who voiced Babe the talking pig in Babe, Chuckie on Rugrats, and Dexter in Dexter’s Laboratory, plays Oblina. The Gromble is voiced by Gregg Berger, whose resume includes Grimlock on Transformers and Odie on Garfield and Friends. James Belushi provides the voice of Simon the Monster Hunter, a recurring antagonist who will stop at nothing to prove that monsters exist. Tim Curry has a recurring role as Zimbo, one of the Gromble’s henchmen. Ironic since Gromble has a little Dr. Frank-N-Furter in him. Other guest-stars who have provided voices throughout the series include: Bronson Pinchot, Xander Berkeley, Lacey Chabert, Henry Gibson, Michael Dorn, and Margot Kidder. 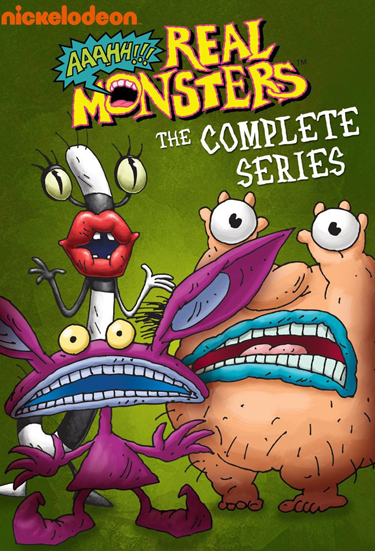 Shout Factory released the first three seasons of Real Monsters on DVD and have now made available a complete series 8-disc set with the previously unreleased fourth season. The video is presented in its original fullscreen aspect ratio. The transfer is a bit soft with minor specks and some muted colors. The audio is presented in Dolby Digital 2.0 mono with an alternate track dubbed in Spanish. Sound is flat, but serviceable with dialogue coming in clearly. Nickelodeon had a solid line of animated programming during the 90’s with Rugrats, Hey Arnold, Doug, and Aaahh!!! Real Monsters, For fans who grew up on those cartoons, Shout’s Real Monsters: Complete Series is a great way to relive those memories and pass them on to the next generation.